‘All the world’s a stage…’ wrote Shakespeare more than five hundred years ago. The works of American photographer Gregory Crewdson reveal that these sentiments have as much relevance to contemporary life as they did to Elizabethan England. In a Lonely Place, the first major exhibition of Crewdson’s photographs to tour Australia, features images that dramatically explore the conflict between the natural, urban and cinematic landscape. Recently exhibited at Melbourne’s Centre for Contemporary Photography (CCP) in conjunction with the Melbourne Festival, the show will soon open at the Institute of Modern Art, Brisbane. The exhibition is composed of select works from three distinct bodies of work dating from the mid-1990s to 2010. In an interview posted on the CCP’s website, Crewdson describes his artistic quest as a desire to ‘search beneath the surface of things for an unexpected sense of mystery’. This quest underscores each of the three series of work on show, which may appear to have little in common at first glance. Yet, In a Lonely Place draws attention to the sense of alienation and melancholy the works evoke. European curators Estelle af Malmborg, Jens Erdman Rasmussen and Felix Hoffmann have put together a lyrical exhibition that showcases Crewdson’s talent for making the ordinary appear extraordinary. Sanctuary (2009-10), a series of black and white photographs shot in Rome, is the first group of works on display. 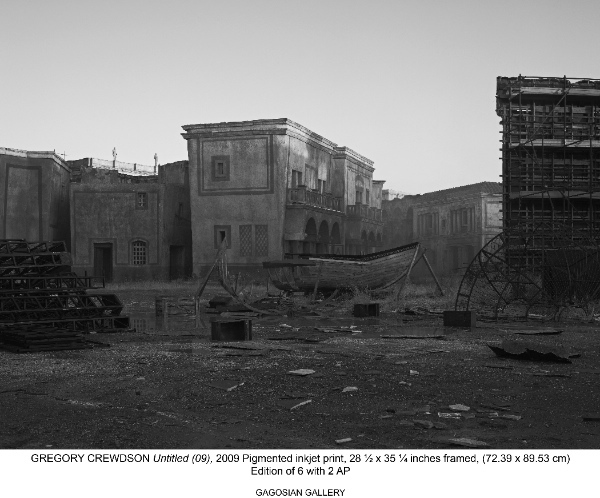 Expressing Crewdson’s self-confessed enthusiasm for documentary photographs, these images take a deserted Roman landscape as their subject; peopled only with buildings. I found myself marvelling at how these photographs could possibly have been taken in the hustle and bustle of the Italian capital. I then read the wall text and realised the buildings and cityscapes depicted are not Rome as I know it, but are the abandoned stage sets of the Cinecittà, a film studio established by Mussolini in the 1930s; the only traces of modern-day Rome are the glimpses of suburban life in the background. This ‘tension between the domestic and nature’, as Crewdson puts it, is more explicitly explored in Beneath the Roses (2003-2008), the next series on show. Both the rich colour and large scale of these photographs of American suburbia make a striking contrast with the earlier Sanctuary images. In Beneath the Roses, Crewdson appears to have intruded on the intimate daily lives of unnamed and uninspiring citizens: there is the overweight middle-aged man seated blackly on his recliner in his drab living room; the mother and son seated for the evening meal and the group of adolescents aimlessly walking along derelict railway tracks. 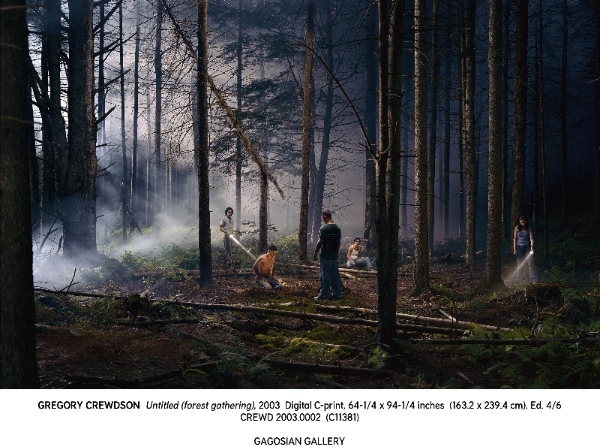 While this may sound rather dull, the effect of the photographs lies in the combination of Crewdson’s subject matter and technique. Utilising large-format cameras and elaborately staging his photographs, Crewdson imbues a rich cinematic quality into this series that emphasises the contrast between the banality of American suburbia and the potential of the camera to add drama and intrigue to its subject matter. I found this series the most compelling of the three bodies of work featured in the exhibition. Fireflies (1995), the final body of work, reveals that it is not only ‘all the men and women’ who are ‘merely players’, to return to Shakespeare’s metaphor. The intimate photographs capture the evening mating rituals of fireflies, performing at once for their prospective mates and Crewdson’s lens. Displayed in a small gallery, I found myself moving into the images, attempting to see the insects hiding within the ambiguous black photographs dotted with the bright lights, for which the fireflies get their name. 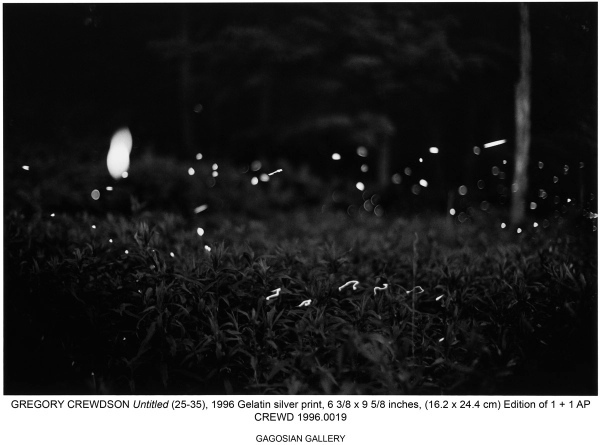 Although the Fireflies photographs are ambiguous, they offer an uplifting finale to the exhibition, suggesting there is the prospect of connection within the alienation of the world. In a Lonely Place presents Crewdson’s poignant commentary on the tension between truth and fiction, the natural and urban landscapes, alienation and connection. The photographer himself expresses this most succinctly when he observed that his works are about ‘the intersection between the possibility and impossibility’. 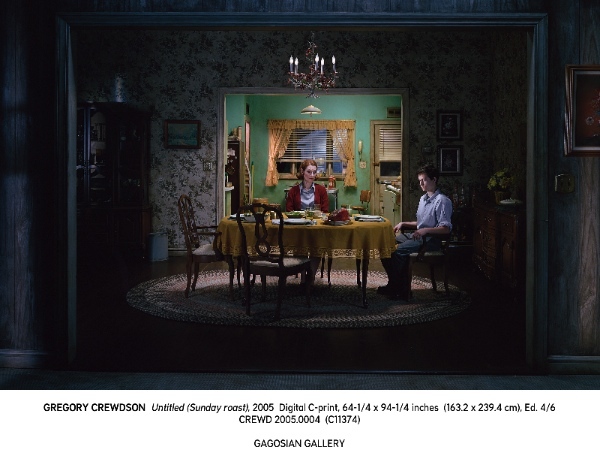 While some critics may dismiss the merit of Crewdson’s work as staged photographs that pose as reflections on quotidian life, I found the bittersweet works featured In a Lonely Place both captivating and moving. In a Lonely Place was exhibited at the Centre for Contemporary Photography, Melbourne from 28 September to 11 November 2012. It will open at the Institute for Modern Art, Brisbane in March 2013. This entry was posted in Art, Featured and tagged art, brisbane, exhibition, film, melbourne, photography. Bookmark the permalink.